Happy hump day, dear readers! Any one else glad that the weekend is almost here? The Thanksgiving holiday threw me off my normal routine and I'm still unsure what day of the week it is without looking at my phone. I'm sure I'll have it all figured out in time for the Christmas holidays throwing a kink in my routine again. I'd be more than happy if the Christmas holidays were moved to a different time of year! I don't care for snow and cold weather so how about literally celebrating Christmas in July?!? It would be fantastic! China Glaze decided to think outside the box this holiday season, and instead of a collection with traditional shades, the Seas and Greetings Collection is all about the warm sun-kissed coast. It's a fabulous break from tradition, and I love the colours! Since there are so many of us bloggers that are swtaching or have already swatched this collection for you, I opted to showcase these beauties in nail art. I've been taking the time to wear and enjoy each of my looks so I've got this broken up into two posts. Let's jump in on two of the designs I created with colours from the collection. Wait, what? Poinsettias? I figured I'd make the transition to non-holiday a little smoother with something a little more traditional for the holidays. I also used the LeaLac stamping plate for the poinsettia image. The More the Berrier stood out to me as an odd outlier for the collection- it felt like a traditional shade that just didn't fit the rest of the collection. It was for that reason I opted to use it for a more traditional look. I'll admit that I wasn't overly excited about a metallic magenta hue, but once I had it on my stamper, I was floored. This baby stamps better than a good number of my stamping polishes! Even if you aren't one for straight metallic nails, I'd definitely recommend it for use in stamping! Twinkle, Twinkle Little Starfish added a nice hint of green sparkle to this nail art design. My other nail art design definitely embraces the seaside "fun in the sun" brightness of the collection! I love the look overall, but the multiple layers of dots is my favorite part of this design! It photographed a little on the pinker side here, but I absolutely love Sand in My Mistletoes! What do you think of these two designs? Do you have a favorite so far? I'll be back soon with another post featuring other designs using this collection! I love both of these! I'm really enjoying the fact that China Glaze picked something non-traditional for this year's holiday collection. 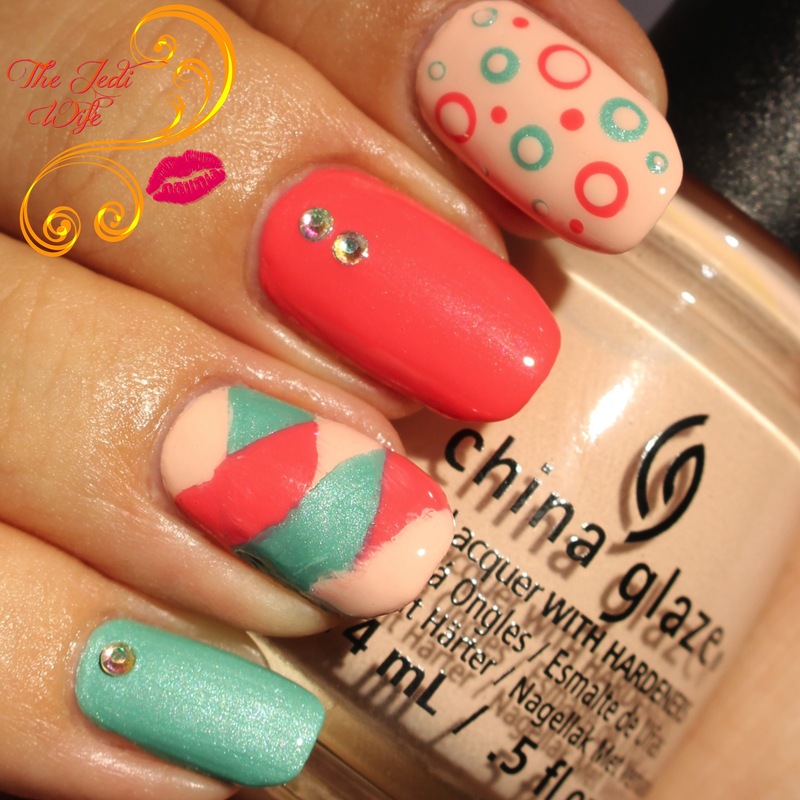 I like both nail art looks you created! Plus this collection is amazing! Those poinsettias! Ahhh, I love that you brought the holiday spirit to the collection! I love that you did such fun designs with these! I really want to like this collection, but I'm so thrown off by the color palette. I would have never thought to have done that second manicure. Those designs work so well together. This collection has so many polishes that work together. Great manis, I love them both! I really like that CG stepped outside the box for this collection. But admittedly I purchased the Orly holiday collection right after swatching these as I was left craving some more jewel tones. Oh my gosh that first mani is to die for! So gorgeous. Such beautiful nail art! I really love that pinky color especially. you had me at dots. I really love how unique this collection is and I love the nail art you chose to do! I am in love with both of these!!!! Great designs and use of colors!! I love this Collection and love that first mani!! Gorgeous! I am crazy about those double dots! That Poinsettia mani is really pretty. I need to try some of these colors too. Your first mani fantastic Jen! Gorgeous mani's. I always love it when regular polishes stamp so beautifully. Love your poinsettia themed mani! That second mani is absolutely fun and stunning. Love them all. Those colors are beautiful! Love the nail art you did!